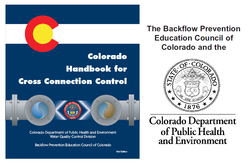 The Backflow Prevention Education Council publishes the Colorado Cross-Connection Control Manual, and the Colorado Handbook for Cross-Connection Control. These books contain valuable information for testers, water purveyors, plumbing officials, inspectors, and consumers. 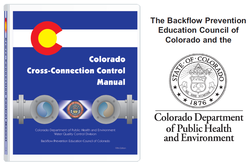 The 2006, 5th edition of Colorado Cross-Connection Control Manual, is available for purchase in a three-ring binder format. The information provided in this educational and technical manual will be incorporated on the national certification exams. Water purveyors and cross-connection control technicians will find detailed information on operation, testing, troubleshooting, and repair of backflow prevention assemblies in this Manual. The Manual is designed as a guideline for public water suppliers and cross-connection control technicians and may be used in conjunction with other state and/or nationally recognized cross-connection control manuals. Click on image for Manual purchasing information. The Colorado Handbook for Cross-Connection Control is a shortened version of the more complete manual. The 2012 edition of this educational handbook includes updated information that is used in the certification exams. The handbook is designed as a guideline for public water suppliers and Cross-Connection Control Technicians. It may be used in conjunction with other state and,or, nationally recognized cross-connection control manuals. Click on image for Handbook purchasing information. The 2012 edition of the educational handbook is available in a spiral binder format.